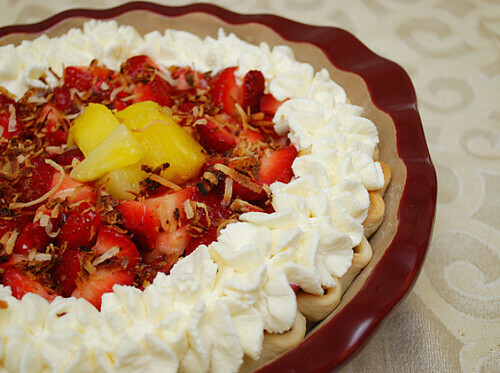 This Hawaiian Strawberry Pie combines the fruity flavors of pineapple and strawberries, along with toasted coconut and chopped pecans. The pie is really a no-bake pineapple cheesecake that you can prepare in a plain pie crust or graham cracker crust (I made it in a pie crust.). The pie is then topped with macerated strawberries and garnished with toasted coconuts and chopped pecans (which I omitted). I also piped fresh whipped cream around the edges for a nice border. It's a very pretty and colorful pie that's delicious if you like pineapple and strawberries... perfect for the summer! Place pineapple in a sieve and smash it to a pulp to release the juice. Reserve juice if desired but you won't need it for the rest of the recipe. Transfer the pineapple pulp to a large bowl. Combine the pineapple, cream cheese and 1/2 cup sugar in a large bowl. Fold in 1 cup of whipped cream. Transfer the pineapple cream cheese filling to the baked and cooled pie crust. Spread evenly to fill the crust. Cover with plastic wrap and chill for at least 2 hours. While pie is chilling, combine the strawberries and 2 tablespoons of sugar; set aside to macerate to release the juices. Drain the juices and set aside just before serving. Just before serving the pie, top the pineapple cream cheese filling with the macerated and drained strawberries. Sprinkle toasted coconut flakes and chopped pecans over the top for garnish. Pipe the remaining 1 cup of whipped cream on the edge as a border and serve. This looks amazing! I'm going to try it for Father's Day dinner. Anything with "Hawaiian" in the title has my attention!! This looks just amazing, Joelen!! I'm definitely going to be trying this soon! That looks great. I like the combination of strawberries and pineapples. This Pie looks so delicious! Oh bless you for posting this! I was jonesing for a piece of that Village Inn pie today, and this recipe looks like the real deal! I'm going to try it this week. I use to get this pie every year for my birthday. All the bakers square restaurant closed in my area many years ago so I have been making my own for years with the same recipe except I use confectionery sugar. I just picked up my items today so I could make my favorite birthday pie.Take care and enjoy!